Food Costs > How Much Does an Ostrich Egg Cost? How Much Does an Ostrich Egg Cost? 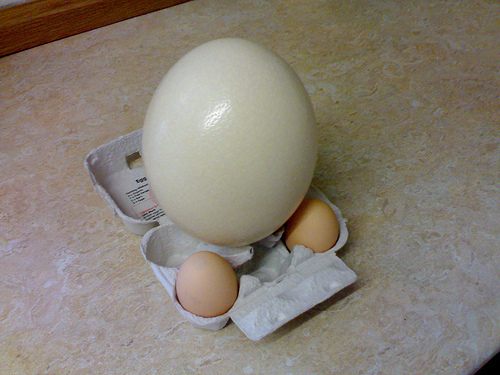 The largest egg of all bird species, the ostrich egg can be cooked just like a chicken egg. Weighing an average of three pounds, one egg is equivalent to two dozen chicken eggs. Depending on the size of the egg, where you’re purchasing it and the time of year, the costs of an ostrich egg can range anywhere from $20 to as much as $50+ per egg. A fertile ostrich egg can cost double this. Floeckscountry.com, for example, offers a variety of ostrich eggs for sale. Their jumbo fresh ostrich egg retails for $75 while the extra large fresh egg retails for $60. Ostrichgrowers.com charges $45 for each egg. Every so often, even though it’s rare, Whole Foods and Trader Joes often carry ostrich eggs. When they do, it has been reported the eggs cost about $20. An empty eggshell, commonly used for art projects, can cost about $20 to $30 each. On Amazon.com, for instance, a premium Grade A ostrich eggshell retails for about $40. Eggs will range anywhere from 15 to 18 inches in diameter. Small eggs are considered those less than 15 inches in diameter while eggs larger than 18 inches are considered to be a jumbo egg. An uncooked ostrich egg has 2,000 calories, and similar to a chicken egg, an ostrich egg has comparable amounts of fat, protein, calcium, vitamin A and folic acid per serving. Shipping costs, if you were to buy online, can around $5 to $20 depending on the size and weight of the package. Priority mailing options are going to cost more. Ostrich eggs can be cooked just like other eggs, assuming you have a large enough pan to cook them in. They can be soft boiled, hard boiled, scrambled or fried. These eggs, when cracked, can be harder than a chicken egg due to the thicker shell. To crack, the most common method is via a chisel and hammer to poke a hole in order to empty the contents. One ostrich egg is more or less equivalent to two dozen chicken eggs. The taste of an ostrich egg is just like that of a chicken egg; however, it is a little sweeter and will be fluffier when cooked. It can be used as a substitute for both duck and chicken eggs. It takes more time to cook an ostrich egg because its shell is thicker and harder than that of a chicken. When refrigerated, an ostrich egg will remain fresh, either in its shell or in a sealed container, for about four to eight weeks. The shiny shell occurs because, soon after laying the egg, the female ostrich spreads a coating onto the shell to protect it from bacteria. Some farmers may offer a bulk discount if you were to buy a dozen at a time.